Laundry Services - ACHIEVE Human Services, Inc. ACHIEVE currently has a laundry service program for on-site (ACHIEVE only) laundry services at this time. The program is part of our ACHIEVE's Group Supported Employment service. 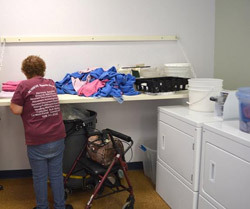 Clients wash/fold rags and mop heads that are used for janitorial services conducted by ACHIEVE including Yuma Proving Grounds, Car wash and ASPIRE Deli. On a daily basis, 2-3 clients work in laundry services alternating between jobs during the day. Currently there are 8 washers and 8 dryers (coin operated) that were purchased with a Community Development Block Grant. Client training includes sorting items, measuring soap and proper folding techniques. Join us for the ACHIEVE Talent Show!